A visit to Sarajevo and the Sarajevo Chamber Music Festival and Institute promises to be a fascinating and stimulating experience. Sarajevo is a gracious and welcoming city and our facilities are a buzz of activity where, in addition to attending the concerts, one can sit in on the rehearsals, lectures, master classes and chamber music coachings of our Institute. Our concerts are held in the historic Dom Armije concert hall whose fabulous acoustics have played host to such legendary artists as Paderewski and Heifetz. 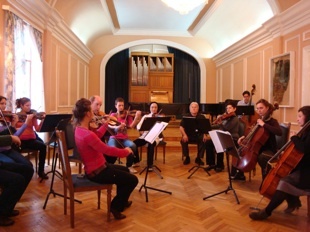 All Institute programs are housed in the Sarajevo Academy of Music where you can drop in on any number of musical activities. Please come to meet the artists and to encourage the students in their pursuits. All our events are open to, and indeed energized by, the attendance of the public.